Manuka honey is a type of honey native to and only made in New Zealand. It is rare, and can only be made for a few weeks a year when the manuka plant is in bloom. Every honey has some antibacterial qualities, which originates from the formation of hydrogen peroxide in the honey. However, this quickly disappears once ingested. 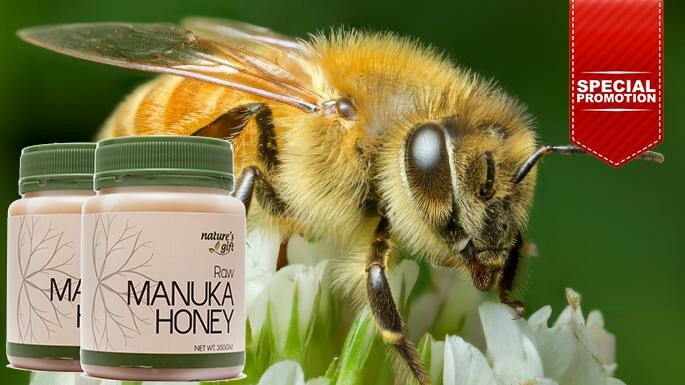 What sets manuka honey apart from traditional honey is its antibacterial properties due to the presence of a major antibacterial component, Methylglyoxal (MG), which is naturally formed in the nectar of the manuka flower. This compound remains stable despite being subjected to body conditions, which is what makes manuka honey superior to other honeys. If you are having a sore throat, manuka honey may provide relief by reducing inflammation and attacking the harmful bacteria. A study has found that after the consumption of manuka honey, there was a significant decrease in Streptococcus mutans (a type of bacteria responsible for sore throats) among two groups of people – normal healthy people and patients suffering from and neck cancer. This means that manuka honey is beneficial for everyone! The antibacterial properties of manuka honey help to fight common stomach disorders. More than 90% of people with ulcers and gastritis (a painful inflammation of the stomach lining) and 50% of dyspepsia (indigestion) sufferers are infected with a bacteria known as helicobacterpylori ((or H.pylori). H. pylori infection is also a strong risk factor for stomach cancer. The good news is that manuka honey fights the bug effectively and naturally, without the side effects which antibiotics produce. Besides that, it also works effectively as a cough suppressant. Research has shown that a 2.5ml dose of manuka honey before sleep has a more alleviating effect on coughs induced by upper respiratory infections compared to drugs such as dextromethorphan and diphenhydramine, which are widely used to treat coughs. Since ancient days, manuka honey has been highly valued for its healing properties on wounds, burns and skin ulcers. Multiple studies have shown that manuka honey can enhance wound healing, amplify the regeneration of tissue and even decrease pain in patients suffering form burns. A study investing the effects of applying a manuka honey dressing on 40 people with non-healing wounds resulted in 88% of the wounds decreasing in size because it created an acidic wound environment, which is crucial for wound healing. Another study has found that manuka honey wound dressings effectively reduced healing time and disinfected diabetic wounds among diabetic patients. This promotion of Honey Manuka [Promo] has ended since 1st January 2022 and is not available for purchase anymore. Visit the shopping cart for the latest update in products.